Inspiration Our team was inspired by the energy crisis that faces the world. For 1.3 billion people, electricity access is a distant dream, and for 2 billion total, steady access is currently nonexistent. The largest concentration of people without energy access in the world is in India, particularly in the agrarian states of Bihar and Uttar Pradesh, where tens of millions live without access. The problem stems from infrastructure issues and incredible wastefulness. It seemed terrible to us when we read that about 30% of the electricity in rural power grids of India is wasted due to extreme inconsistencies. Very few people have constant access to energy, and everyone tries to access during certain hours. The way energy grids work, when many people want to tap into the grid at the same time, inefficiencies skyrocket. We intend to become the enablers for people in rural India who do not have normal or reliable access to electricity. 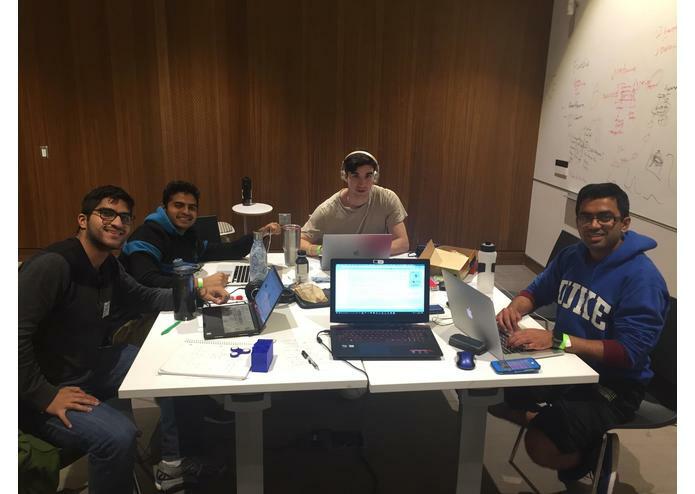 We have all had a passion for energy access before coming to HackDuke, and believe that blockchain can revolutionize the energy access that rural areas are able to receive by making transactions safer and easier. Instead of coming up with an expensive, high-infrastructure solution like microgrids, however, we decided to make a product that can solve problems starting today. We were inspired by SMS-based products, because those are able to be implemented in the poorest regions globally. EnerGenius is an SMS-based service where consumers of energy can text directly to the power grid when they need to reserve or immediately have access to energy. They are then asked to enter their request in a specific format, and their energy request is put in to the power grid. We used a heroku deployed Python Flask to build a webapp that receives text messages indicating when a user would like to receive energy from a distribution company. The app then updates JSON files that are publicly available for a website to display. We ran into the challenge of getting a lot of correct data with information on average household electrification rates, amount of energy used by a family daily, rural vs. urban settings. We had to scour the world bank, International Energy Journal, and many of Duke's research sites to create a firm backing for our business model and product. We also ran into challenges learning how to use twilio with Flask and Heroku, but the process was both fun and rewarding. We are proud of creating a price equation based on the number of people requesting energy at a certain time and the amount being requested to create an equitable system. This equation allows us to level the playing field for all homes and decrease the 30% of waste that goes with these grids. We are also very proud of how well we fleshed out the idea from an economic, social, and environmental standpoint, making this a triple bottom line product. Also, we are proud that our website looks really good and displays data accurately, as well as the functioning SMS system. We learned a lot about the problems faced in the energy sector, and about the challenges that come with new teamwork. We also learned that we really love working together and all truly care about the idea. Throughout, the more we read about energy deserts, problems that exists, and technologies that are emerging, we learned that we are extremely privileged with regards to power, and that the software and business skills that our team had can actually create a huge impact for millions of underprivileged people. We hope to do well in the competition and potentially enter the Duke Startup Challenge/Hult Prize this year. Our team can also make connections overseas and look for opportunities for implementation in the states of Bihar and Uttar Pradesh, India, the two most agrarian states in India. Additionally, we intend to keep working on our customer value proposition, technology and operations management plan, go-to-market plan, and profit formula, which we feel capable of making with the research that we have done up to this point.